While not one of the traditional “R” months, open to commercial oyster harvesting and yielding the plumpest Chesapeake Bay oysters, George Erichsen, Director of St. Mary’s County Department of Public Works & Transportation announced that June would be the start of his office’s trash drop-off centers’ accepting oyster shells for recycling. Beginning in June, all St. Mary’s County Convenience Centers, with assistance from the Oyster Recovery Partnership’s (ORP’s) Shell Recycling Alliance (SRA) program, will begin collecting used oyster shells. 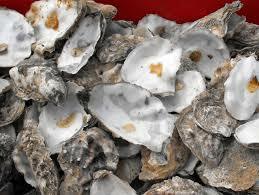 The shells will be used as substrate on which to plant new oysters in the Chesapeake Bay. Oyster shells will be collected in specially marked recycling containers and transported to the Horn Point Lab in Cambridge, Maryland – the largest hatchery in the world for our native oyster. Once the shells are aged and dried, each shell is “seeded” with about 10 baby oysters and then “planted” back into the Bay. Oyster reefs are believed to be critical to the restoration of the Bay, but the limited availability of oyster shells has become a barrier to restoration. An adult oyster can filter and clean approximately 50 gallons of water a day, and healthy oyster reefs provide an ideal habitat for other important marine life, including blue crabs and striped bass. “Hopefully this program will help make people aware that the shell they usually throw away has an important greater purpose,” said Mr. Erichsen. The SRA program began in 2010 with 21 restaurants in Baltimore and Annapolis. Today, it includes over 200 businesses, local governments, and individuals throughout the Maryland, Virginia, and Delaware region. For more information and a video of the oyster recovery program, visit here.